Click on the book and buy direct. We are well into the season and it is now right after Thanksgiving. When I was a mere boy and hunted with my Dad, when Thanksgiving came, it was over. Everything was frozen and the birds had mostly left the area. I can remember the two of us going down to a state hunting preserve southeast of Council Bluffs called Riverton. It was along the Nishnabotna river near the small town of Riverton. We put sacks of decoys on sleds and walked in on the ice. We found a spot where we could put up a blind and placed the decoys right out on the ice. I tell this to some of my friends today and they can hardly believe it, but it happened. There seemed to be a few ducks that hung out at the reserve and probably got their water from the river. 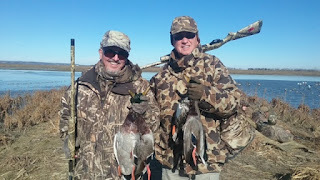 They came into the decoys and we had excellent shooting. We would be the only people hunting on the preserve. Those days are long gone. Also we shot with lead and it was so much better than the shot today. We also shot with two and three quarter inch shells. Now today, I shoot a gun that fires three and half inch shells with a mixture of hevi-shot and steel. Gone are the days. It was nothing to have a limit of mallards by noon. Compare it to today when a group of people will sit in the blinds waiting for a shot almost all day. There was not the competition from other hunters like there is today. Where I hunt there are six blinds within a mile and that brings competition. The birds will go where they are less likely to be bothered. We have an advantage of 40 acres of water with a bubbler that is right in the middle. We always have open water. Still, gone are the days. There was only a handful of hunters when I arrived at the big chicken in Tekamah before heading to the blinds. Everyone was optimistic as there was an excellent weather shift all the way to the Dakotas. Freezing temperatures with heavy snows was covering the ground north of us. This should be it, and everyone was in agreement. Good northerly flow the past few days should drive the birds out and send them our way. Beautiful sunrise over the lake in the morning. Two days ago there was a north wind and the hunters that went witnessed huge flocks of migrating snow geese. What we had seen in the past was when the snows came the mallards came too, so everyone was hopeful. My wife and I have not had the pleasure of mallard duck breast for over six months. It was now or never. As I approached the blind, there was just a light breeze and a small ripple on the water. It was out of the north so that was fine, as long as it was out of the north. There were no birds on the lake when we came in. Not a good sign. We settled in and waited for shooting time. None of the other blinds in the area were shooting when the time to start came. We waited. Some pairs and small groups came to the decoys as the morning wore on. Each time they locked and came into the decoys there was opportunity. I was in the northern most blind and the better shots were at the blind to the south. Finally, we had an opportunity and I got off a shot. Three other guys shot too so I have no idea if I scored, but at least for this season, I fired off one shot. The rest of the morning it went dead calm and finished off the day for me. It was time to hang it up. I grabbed a couple of birds as I left as I had not taken any all season. My good friend and I leave with our birds for the season. There is always another year. Gone are the days.